Outside of Hunt, Texas sits Stonehenge II, a copy of the original Stonehenge located more than 3,500 miles away on the Salisbury Plain in England. 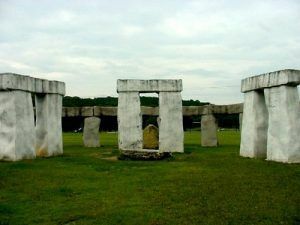 Sixty percent as large as the original, the Texas Stonehenge was built by Al Sheppard and Doug Hill, two visionary Texas cowboys with money to spend and time to spare. It all started when Doug Hill had finished pouring a patio in 1989. Left with a spare slab of limestone, he offered it to his friend and neighbor, Al Sheppard. Sheppard liked how the stone looked and soon planted it upright on his property, but he wasn’t sure people could see it from the road. From there, Al and Doug built a 13-foot arch behind the monolith and that was just the beginning. Soon, a whole circle of “stones” began to rise from the earth. Doug Hill began to fabricate stone “look-alikes” from steel, metal lathe and plaster. Painted and anchored with cement, these fabrications look like the real thing. After about nine months, their masterpiece was complete. Or, so they thought. No, some eighteen months later, two 13-foot-tall Easter Island look-alikes were added, standing silently guarding the Stonehenge masterpiece. Al Sheppard passed away in 1994, but the property remained in his family until 2010. 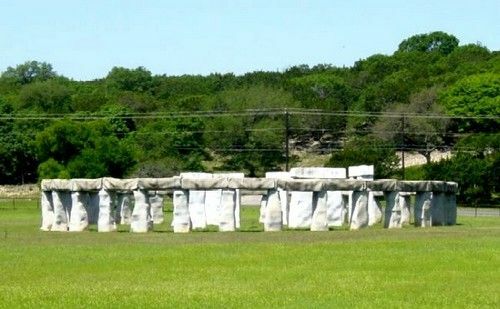 After the property was sold, Stonehenge II was relocated to the Hill Country Arts Foundation in Ingram, TX. HCAF is located just off Junction Highway at 120 Point Theater Rd. South.